An infrequently seen pattern found only in punch set pieces. 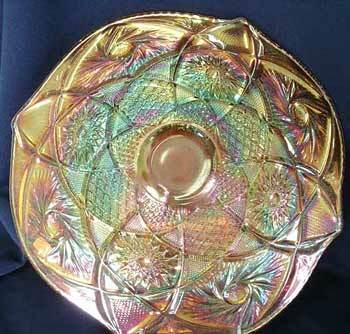 The bowl measures almost 14 inches across and the set is 13 to 14 inches high. This is somewhat larger than an identically named set by US Glass. 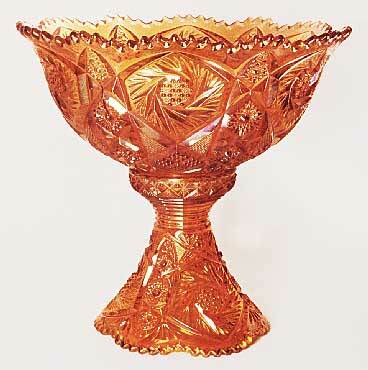 This marigold punch bowl and base sold in 1997 for $625 and again in 2011 for $450. Other sets have sold at auction, but as I have not seen them, I can't confirm which set, or even if they are this pattern (a 6-piece set in marigold listed as Imperial sold for $275 in 1998; an 8 piece set brought $100 in 2005). In 2012, marigold 8- and 13-piece sets sold for $25 each. In 2013 and 2016, marigold punch bowl and bases sold for $275 and $120, respectively. The Imperial set was reproduced, with the IG mark hidden within the pattern. 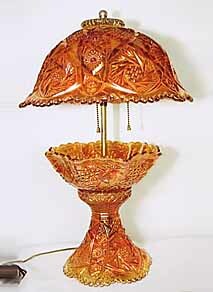 On the right is a lamp made from a punch set. It sold in 2003 for $325. The 14-inch marigold plate at the left was apparently flattened from the punch bowl top. It sold in 2007 for $350.